Aircraft importation in the EU: does the flight pattern/geography and size/type of compensation matter? Does the size and type of compensation matter? This survey no. 3 must be seen in connection with the scenario used for survey no. 1 from October 2017. Survey no. 1 has also been updated December 2017 with further information. Many corporate aircraft are flying internationally. 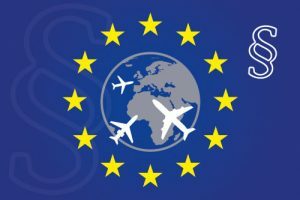 We have therefore commissioned another verification survey about the impact when a fully EU-imported corporate aircraft is used for non-business purposes outside the EU. How can the compensation part be handled in order to prevent a correction of the input VAT, if the VAT has already been reclaimed 100%? The geographic area is extremely relevant to look at in this context and again the result is close to unanimous. This means that any non-business legs flown e.g. in the USA by an American part 91 corporate operator will actually have an impact on the EU VAT handling if the aircraft has been fully imported in the EU and the VAT have been reclaimed 100%. Which geographic area will be included when the potential extent of non-business use of an imported corporate aircraft shall be determined in relation to the correct VAT handling? 1. The private usage is either regarded as a taxable supply of passenger transport services; in that case, only German travel distances are subject to German VAT, or it is regarded as a taxable supply free of charge, which would be (according to a specific German provision) subject to VAT where the operator is established. The size of the compensation matters, and the result is for most EU-member states that an amount close to market-rate must be paid as compensation to the importer for any non-business us of the aircraft. Germany has another way to handle this issue and Netherlands was not able to give a precise reply, please see the explanation notes for both below. A correct compensation paid directly to the importer will typically mean that no correction of the input VAT is needed, if the VAT have already reclaimed 100%. The use of imputed income to compensate any private / personal / entertainment use of a corporate aircraft is generally not accepted and will not exclude an EU VAT claim. Please also be aware of that the US use of SIFL will not solve the compensation problem as these values are often too low to be considered market-rate. How is it possible for the management or owner family to pay compensation for any non-business use of a corporate aircraft? 1. A correct compensation payment in Denmark could be an amount close to a business class ticket on the same leg, but this interpretation can vary in each member state. 2. The private usage is either regarded as a taxable supply of passenger transport services; in that case, only German travel distances are subject to German VAT, or it is regarded as a taxable supply free of charge, which would be (according to a specific German provision) subject to VAT where the operator is established. 3. The Dutch VAT legislation is unclear on the matter. If the private use qualifies as a benefit provided to personnel or as a business gift, a correction of input VAT should in principle be made. This could be avoided if the private user pays a compensation that is at least equal to the cost price of the private use but advisedly close to a fair market price to avoid any problems. 4. It is unclear if the Dutch rules for fictitious supply of a (transport) service can be used as a compensation in order to prevent a correction of the input VAT. The typical calculated amount for a fictitious supply seams small and is often only used for domestic flights. The use of fictitious supply of a (transport) service can therefore be seen as a shortcut to use a corporate aircraft for non-business purposes EU/worldwide without any real VAT consequence. 5. Imputed income means that the importer is not receiving any direct compensation payment for non-business flights. There might be differences between EU member states, but the bottom line is that the European Court of Justice has the final say. With the present picture painted by the ICIJ and the Paradise Papers, the OXFAM list and the EU Commission blacklist and grey list of Tax Havens it is quite certain that the EU member states, the Commission, the Parliament and the politicians in general will pursue any abnormalities.